Mrs. Fields Goes to the Movies! 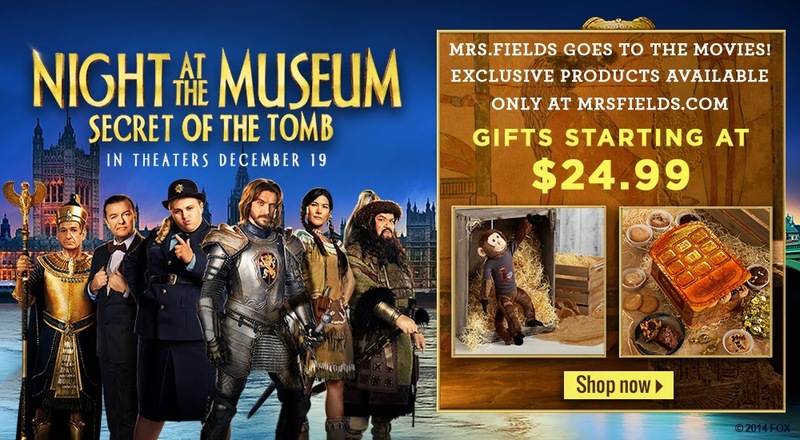 Get ready for the most wild and adventure-filled Night At The Museum ever with exclusively licensed products available only from Mrs. Fields. Pharaoh’s Golden Tablet Gift Box: Bring your holidays to life with this treat-filled replica inspired by Pharaoh Ahkmenrah's magical gold tablet in Night of the Museum. Opens to reveal 24 Nibblers® bite-sized cookies, 2 brownies and 5 oz. of butter toffee. Perfect for storing all 3 Night at the Museum DVDs once the treats are gone. Solves the ancient Egyptian riddle of what to give for the holidays. Dexter the Monkey: The capricious capuchin of Night at the Museum is back with sharable sweets. Ships with 18 Nibblers® bite-sized cookies and 2 frosted cookies. Also available as an add-on to the cookies of your choice. 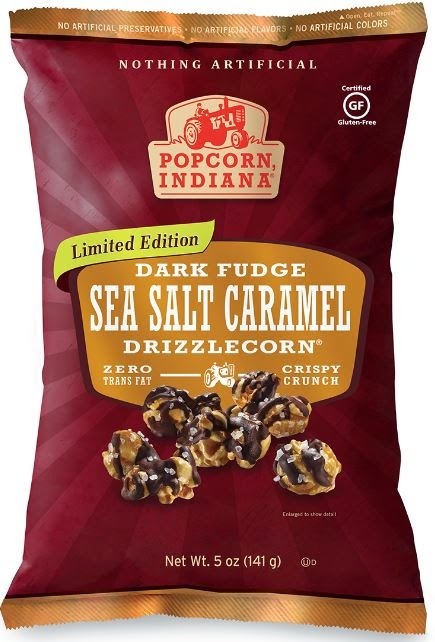 Popcorn, Indiana is the perfect stocking stuffer for food lovers out there. This ready-to-eat popcorn is offered in a variety of flavors such as spicy Sriracha and America’s #1 Kettlecorn. Its seasonal Drizzlecorn, offered in four delicious flavors, is great for those looking for something salty and sweet. 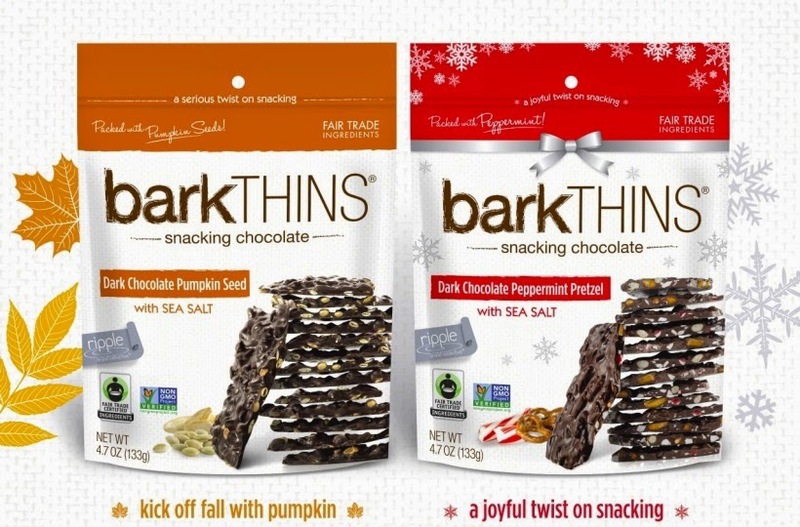 They even offer FIT an option for those looking for a better-for-you snack! Shopbake.com is Canada's first and only online bakery marketplace. Order your holiday baking treats and sweets from your favorite bakeries online, and discover new gems across Canada. 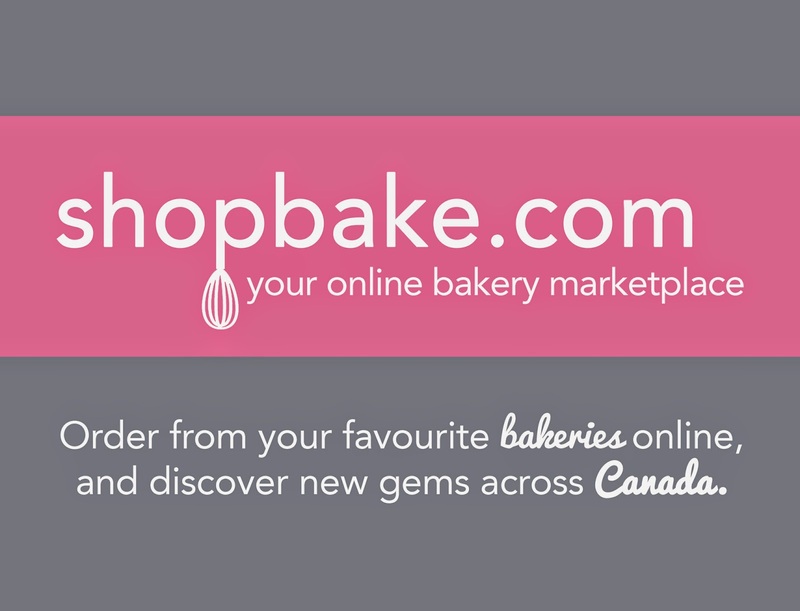 Shopbake.com is your destination for the very best sellers of baked goods in Canada. Shop for cupcakes, cookies, cakes, bread, and more. Aside from regular baked goods, find nut-free, Kosher, gluten-free, vegan and other specialty bakeries close to your location. Sell your baked goods on shopbake.com! Build your own shop quickly and easily, and list your products for Canadians all across Canada to purchase. It's free to open a shop! These commemorative tins are limited-edition Ganong keepsakes. Each lid features a 1950’s vintage design, carefully selected from the archives of Ganong. Collect all 3 tins as part of our heritage series. Inside each tin is our Delecto Assorted Milk Chocolates: chewy milk caramels (made with real Canadian dairy milk), crunchy whole almonds, Chicken Bones nougat (spicy cinnamon flavored cream centre), maraschino cherries, maple cream (made with real Canadian maple syrup) and Pal-o-mine fudge pieces. Located on each tin’s insert will be an authentication code. Enter the code online in the 2014 Delecto Holiday Photo Challenge for an exclusive online rebate. Ganong is Canada’s oldest chocolate company, now with the 5th generation running the business in St. Stephen New Brunswick Canada. 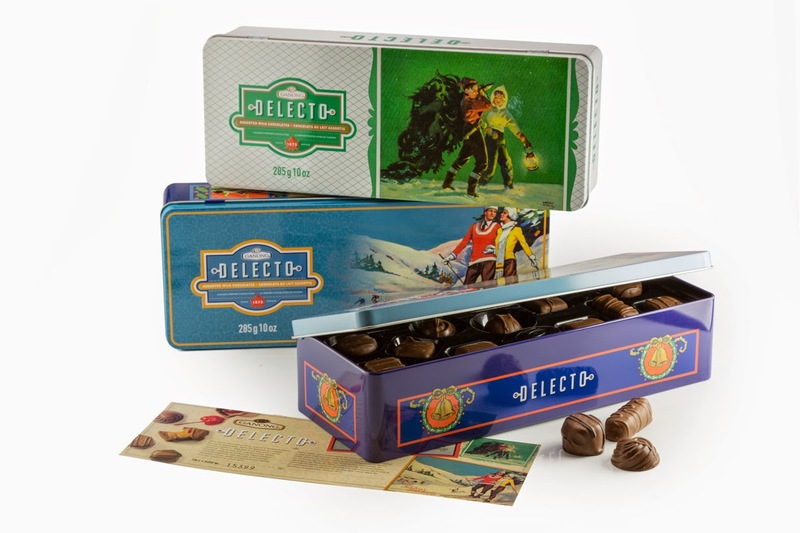 Since 1873, Ganong has been an innovator responsible for many Canadian confectionery firsts: Delecto boxed chocolates, chocolate nut bars, heart-shaped boxes and Ganong Original Chicken Bones and much more. Discover Ganong’s Canadian chocolate heritage. **Watch this spot for more sweet treat ideas for the holidays. 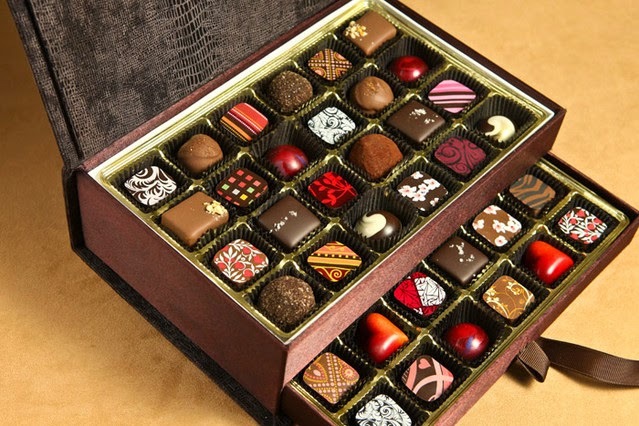 There are some great gift ideas here and anyone would be happy to receive these products, just too yummy and I do love chocolate.